Just two days after United States citizens lined up at the polls to vote in their nation’s presidential elections, tens of thousands of Argentines will put on a different type of democratic display, a cacerolazo. As a sequel to the massive protests held on September 13, organized mainly through social media, unhappy Argentines are planning once more to voice their discontent over such pressing issues as financial instability, media freedom, and personal safety. They will again voice their displeasure with the current government by turning to pots and pans, or cacerolas from which the protests derive their name, as home-crafted musical accompaniment to their outcry. Turnout for the November 8 demonstration, or “8-N” as it is called in Argentina, is expected to be even greater than that of the September protest because, this time, the movement has been better organized and more comprehensively advertised. Taken together, these various reactions and the 8-N social media campaign imply that an increasing number of Argentines are bitter about the government’s response, or lack thereof, to the demands of the latest protests. In the hope that government officials will be more likely to acknowledge the significance of the manifestation and take steps to answer concerns that had already been raised by protesters on September 13, 8-N participants have continued to emphasize the importance of a well-organized movement by means of social media, which has allowed them to avoid depending upon a single leader. As expected, the opposition’s Federico Pinedo, a representative from Macri’s Propuesta Republicana (PRO) party, has predicted that 8N will be “massive.”4 Those participating in 8-N want to send a message to the ruling party, emphasizing the people’s political clout in a democracy and reminding government officials of their representative role. On the other side of the debate, Buenos Aires Senator Aníbal Fernández, President Kirchner’s former cabinet chief, maintained that the protests are simply “an invention sponsored by a faction of the ultra-right.”5 However, in order to better understand the significance of 8-N, one must cut through the polar rhetoric, keeping in mind that Kirchner still enjoys significant support and recognizing that it is especially unlikely that a small “faction of the ultra-right” would be able to stir such significant participation from the Argentine public. 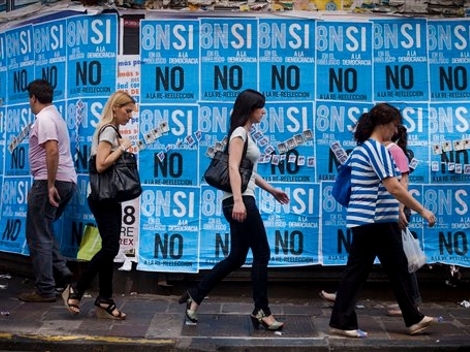 During a recent debate held by the Gino Germani Institute at the University of Buenos Aires (UBA), Edgardo Mocca, a political scientist and professor at UBA, presented a less politically charged analysis of 8-N from a historical angle. Mocca explained that “the people who go out with a cacerola have the corporal memory that: every time that the cacerolas go out on the streets in a certain quantity and with a certain climate of enthusiasm, something changes in politics.”6 The corporal memory he mentions refers to similar public movements that have influenced government change starting in 1930 and continuing all the way into recent decades. In an interview with COHA, Ricardo Gjivoje, a former Argentine senior official of the Organization of American States, emphasized the heterogeneity of the protesters, listing a wide range of concerns, which include Kirchner’s policies against the freedom of the press, energy and public transportation issues (indeed, many parts of Buenos Aires have experienced intermittent and prolonged blackouts because of a power crisis which began in late October), as well as restrictions on currency exchange. According to Gjivoje, the large scope of issues raised by the protesters, despite its contribution to the vast participation in the movement, highlights the current division and disorder of the opposition. This disorder among the opposition has been highly conducive to the ease with which the majority of Kirchner’s policies have been passed. While it is unlikely that the 8-N movement will lead to an ousting of President Kirchner, the ruling FPV party recognizes the greater consequence of the upcoming November manifestations: the potential unification of the opposition into a legitimate political threat to Kirchner’s power. In fact, the highly divided opposition was one of the main reasons for Kirchner’s resounding victory in the 2011 presidential elections. Although not all of the cacerolazo participants come from a homogenous political background, a significant segment find themselves standing together against a common adversary with the hope that, collectively, they can affect political change in Argentina. This could be the opposition’s first significant step toward finding a stable platform and common ground from which to challenge the Kirchneristas’ hold on the presidency, which, up to now, has been relatively secure. 1 “La protesta, las respuestas y los ecos,” Diario Castellanos, September 17, 2012, http://www.diariocastellanos.net/9367-La-protesta-las-respuestas-y-los-ecos.note.aspx. 2 Horacio Serafini, “La Rosada intentó minimizar la protesta,” La Voz del Interior, September 15, 2012, http://www.lavoz.com.ar/movil?nota=613969. 3 “Cacerolazo: El kirchnerismo minimizó la protesta y Scioli pidió ‘escuchar a la gente,’” LaNoticia1, September 15, 2012, http://www.lanoticia1.com/noticia/cacerolazo-el-kirchnerismo-minimizo-la-protesta-y-scioli-pidio-escuchar-a-la-gente-54194.html. 4 “Voces a favor y en contra del 8N,” QuilmesPresente, November 5, 2012, http://www.quilmespresente.com/notas_actual.aspx?idn=167036&ffo=20121105. 5 “La propuesta del 8N es un invento de una facción de ultraderecha paga,” Semanario Argentino, November 5, 2012, http://www.eldiarioargentino.com/358527-La-propuesta-del-8N-es-un-invento-de-una-fraccion-de-ultraderecha-paga.note.aspx. 6 Edgardo Mocca, “Los sentidos de las cacerolas: La oposición inhibida,” Pagina/12, November 5, 2012, http://www.pagina12.com.ar/diario/elpais/1-207132-2012-11-05.html. 7 Laura Serra, “‘8-N Yo no voy’, la campaña web para neutralizar el efecto del cacerolazo,” La Nación, November 6, 2012, http://www.lanacion.com.ar/1524045-8-n-yo-no-voy-la-campana-web-para-neutralizar-el-efecto-del-cacerolazo. June 10, 2008 COHA Comments Off on A Kinder, Gentler Hugo Chavez?